Landscape Stewardship Tips - Your Property Matters! Plant smaller species under power lines so that utility companies will not damage them through trimming or removal. Larger species should be planted at a safe distance from the lines. If species are removed, replant to restore natural beauty and ecological services lost. When trees are removed, replanting is necessary to prevent invasive species moving in to the newly opened canopy, to prevent erosion, and to restore habitat for birds and other wildlife. Appropriately-sized, smaller native tree and shrub species for sun or part-sun under power lines include Eastern redbud (Cercis canadensis), Red buckeye (Aesculus pavia), Allegheny serviceberry (Amelanchier laevis), American hornbeam (Carpinus caroliniana), American fringetree (Chionanthus virginicus), Bottlebrush buckeye (Aesculus parviflora), native viburnums, and sumacs. For part shade conditions, consider native witch hazel (Hamamelis virginiana) or American dogwood (Cornus florida) which produces high fat berries at just the right time for migrating birds. You don't need to plant large specimens. Small trees are sufficient and tend to do better over time. Just remember not to plant your trees too deeply. This is the most common mistake. The root flare (the point where the bark meets the roots) should be visible at the surface. This helps to prevent rotting at the base of the trunk. For the same reason, keep mulch away from the trunk bark. It should ring the tree but not touch it. This is another common mistake in landscaping. Finally, be sure to tease roots apart in the planting hole so that they spread wide for long-term stability, and don't amend the soil. Native soil is ideal for native trees. Happy planting! ENGLISH IVY - Did you know that English Ivy can harm trees? Please remove what's on your trees to help keep our neighborhood tree canopy healthy. If you can’t remove the roots of your English ivy because the vines are so big, cut a section of the vine out at the base, as seen in this picture. The upper portions of the vine will eventually die giving your tree a chance to survive…and thrive! We have a preponderance of this non-native vine in Penn Valley, particularly on trees along property lines and roadways. Give your trees a chance by cutting a section of the vine out at the base. You can do it yourself with hand pruners and a hand saw or ask a landscaping company. Don't try to pull off the upper portions of large, well-established vines because this can damage the tree bark. Just allow it to die in place. Roots will eventually regrow, and you can cut them again or work to remove the root system. 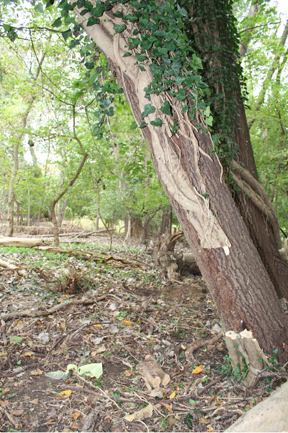 The photo above shows a section of vine removed to prevent further growth up the tree. This is something you can do at home. Please share this information with your neighbors. Ivy damages or even kills trees over time by weakening branches with its weight or keeping light from penetrating leaves. Our trees are under a lot of pressure right now, and the simple task of setting back the English ivy on your property could go a long way to protecting these majestic beauties and our neighborhood tree canopy. For more info, see this link to a nearby Conservancy who is also asking its residents to remove English ivy. Thanks for your help! Natural habitats suffer under construction development, the use of pesticides, and climate change. Non-native ornamental species used in traditional landscaping provide little food for caterpillars or birds and often move into natural areas degrading habitat there too. We are losing a large number of species because they have few places to live and little food to eat. Help bring back vibrant living landscapes by adding high wildlife value trees such as native oaks, birches and dogwoods. Layer in native shrubs like witchhazel, serviceberry and viburnums, and plant high value herbaceous species such as asters and goldenrods. Click here for a list of high value native plants based on your zip code. Consider removing non-native species that insects cannot metabolize and learn how to identify and remove particularly invasive species that are harmful to the local ecosystem like barberry shrubs, burning bush, non-native viburnums, English ivy, winter creeper vine, Norway maples, Amur cork trees and Bradford pear trees. These species are carried by birds to natural habitats where they create monocultures that supplant native trees and therefore degrade the capacity of our woodlands to support the life depicted in our mural. Interested in the bird-friendly ecological value of native plants? Want to support pollinators including our native bees? Learn more about native plants for your area here. Click here to read about Doug Tallamy’s insightful book called Bringing Nature Home. This University of Delaware entomologist describes the special relationship between insects and their host plants and lists high value trees and shrubs that you can incorporate into your space. Do you live near a stream? Did you know that a minimum 100 foot buffer of trees and shrubs on each side of the stream is required to prevent erosion, slow runoff and filter pollution? Our streams have degraded in recent years. Stream banks are eroding, overwhelmed by heavy storms and too much runoff from pavement and lawns. Lawn chemicals, road salt and silt (soil runoff) pollute our streams and drinking water and make life difficult or unlivable for aquatic organisms; Fish can no longer live in our streams. Our Township is executing a plan to restore stream banks on public land, but we as individuals have the potential to make a greater impact in working together to restore and protect habitat along streams on private property. Convert lawn areas to native tree, shrub and perennial plantings. Deep roots will absorb much more water than non-native lawn grasses. Most importantly, please do not deforest your property. Our native trees are treasures from the past that define Penn Valley and provide a tremendous number of ecosystem services including providing bird habitat and absorbing airborne heavy metals. Our wooded areas exist on private properties but are truly a shared resource, and we cannot get them back overnight. Leave dead wood standing, especially in natural areas of your landscape. Roots hold soil in place, and tree snags provide necessary habitat for owls, woodpeckers and songbirds. Remove invasive plants/trees. Common invasives in our area include Norway maples, Amur cork trees, burning bush, barberry shrubs, non-native viburnums, privet and wineberry. Replant native trees and shrubs in these areas. For more information, see this Delaware River Keepers brochure on 20 ways to protect your stream side property. Hard copies of the brochure are available at our meetings. Visit www.streamsmarthousecalls.org to obtain a free consultation from the Lower Merion Conservancy on ways to reduce stormwater runoff on your property. Native trees provide tremendous ecological services including temperature insulation around homes, absorption of stormwater runoff, cleaning of particulate matter and heavy metals from the air and providing food sources for birds, butterflies and other pollinators. Our tree-lined streets are a source of neighborhood pride and create an important sense of place. Consider planting young trees to help replace the older ones that are dying. See the images below for ideas on protecting new trees from deer damage. Local sources for containerized native plants and trees. Be sure to check websites or call for hours and dates of operation. Bring our beautiful American goldfinches to your yard by planting Joe Pye weed (Eutrochium fistulosum), tall coreopsis (Coreopsis tripteris), Great coneflower (Rudbeckia maxima), Purple coneflower (Echinacea purpurea), Wild Bergamot (Monarda fistulosa) and other seed producing natives. Have trouble with deer? See the images below for ideas on how to protect young tree plantings. Simple metal garden stakes and galvanized wire will protect young trees while they get established. Once a tree is over 5' tall, the deer will not be able to reach the higher foliage for grazing. Black wire or plastic mesh often blends well with surroundings. Deer bucks will rub trunks killing young trees or causing bark wounds that are difficult for the tree to heal. Wooden tree stakes will protect this sapling until it gets larger. 3-4 stakes of metal rebar placed around this tree are barely visible and will keep the deer at bay while it matures. Consider leaving protection around the tree until the trunk is 6-8" in diameter. Rebar can be reused with future plantings. Learn to identify and remove invasive species. Click here for a list of over 10 reasons to remove english ivy. Do you have a tree covered in vines like this? English ivy is often the culprit. It damages tree bark, blocks light, weakens limbs and can make trees more susceptible to pests and disease. Help steward our trees by simply severing vines from their roots. If vines are quite large, remove a 6-8" section with a saw. Do not cut into the tree bark or attempt to remove upper vines if it damages the bark. Without roots, the vines will eventually die. Note: If vines are brown and hairy, do not touch them as they could be poison ivy. Click here for a list of invasive plant species in Pennsylvania as maintained by the PA Department of Conservation and Natural Resources (DCNR). Plants on the list include Japanese barberry, Norway maple, privet shrubs, burning bush (winged euonymus), English ivy and Japanese spirea. Many of these have traditionally been planted in our landscapes because of their aesthetic qualities, but we now know that they pose a threat to the greater ecosystem and should be removed. The good news is that there are native alternatives that will bring more birds and butterflies to your space. Fall garden care tip: Leave the leaves! Did you know that many butterflies and other beneficial insects overwinter in leaves? They provide critical food for year-round birds or emerge in spring when the weather warms. Leaves also provide the perfect soil enrichment under the trees in which they fall. Pine needles provide the specific enrichment for pine trees, and oak leaves provide the proper balance under oak trees. Consider leaving some leaves under your trees to honor nature's elegant design, keep your trees healthy and support the broader ecosystem. More info in this Penn State Extension article on fall garden care for pollinators.